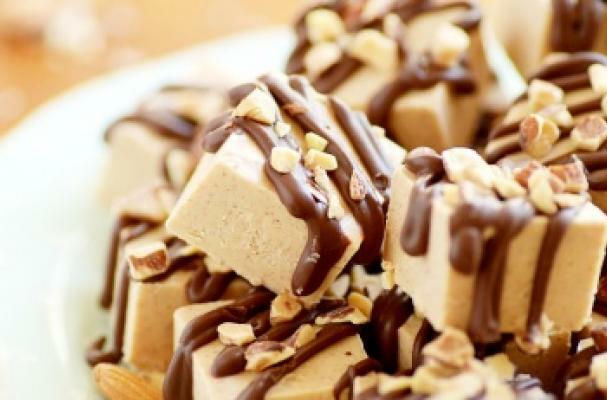 Fudge fans rejoice with this fabulous recipe for almond butter fudge. This easy candy is perfect for a gift or your contribution to the office Christmas party. As an added bonus, those who suffer from a peanut allergy can enjoy it without the fear of a reaction. I like to take this recipe one step further and add chopped toffee bits on top. Sep 1: Over low heat on a stovetop, melt together the almond butter and white chocolate until smooth. Step 2: Line an 8 x 8 rimmed baking dish with parchment paper or foil. Pour the almond butter and white chocolate combination onto the prepared baking dish and let cool for six hours at room temperature (or in the refrigerator for one hour). Step 3: Cut into small, 1-inch squares and top with a drizzle of melted milk chocolate and chopped roasted almonds. Step 4: Best if stored in the refrigerator in an airtight container.